Smart Grids? OT – IT Integration ? Many IT managers in utilities have to deal with increasing pressure to modernize their IT business processes to deal with new challenges, technology advances or simply new legal requirements. OT – IT integration and Smart Grids are in this context buzz words, where it is not always clear, what – to begin with! – do I implement here, what are the efforts and what are the benefits? I’d like to discuss in this blog the benefit of integrating various IT systems. Let’s face it – every utility has a number of IT systems. Many have SAP as an Enterprise Resource Planning system, probably every utility has a SCADA and nearly every utility has also a GIS (Geographical Information System) to not only document the location of their highly valuable assets but also manage e.g. topology or reporting requirements. However, the typical utility processes, such as maintenance management, workforce management, new customer connections, new solar panel applications etc. are not bound to only ONE IT system, no, they span across various IT systems: Let’s take the example of the maintenance process: Step 1 – possibly in the map of the GIS it is the easiest place to put together those assets which have to be maintained based e.g. on location (proximity), age or last maintenance date. 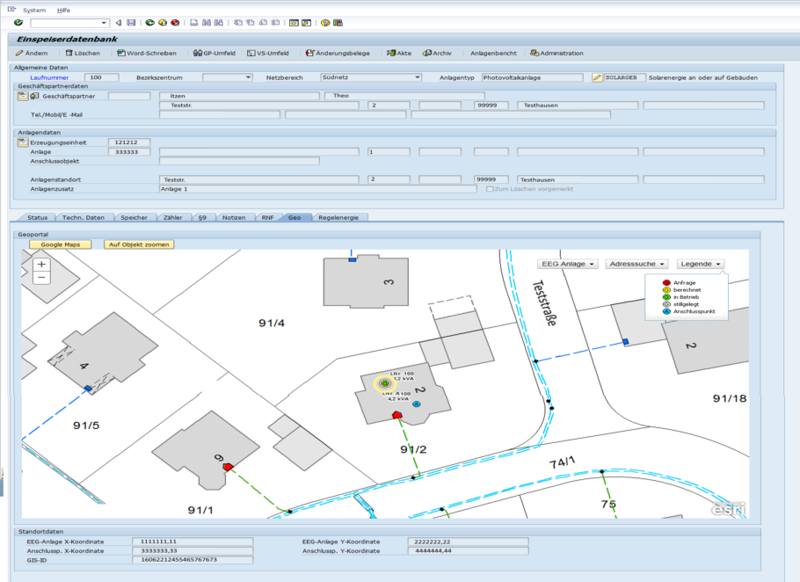 Step 2 – it will probably be your SAP PM or SAP EAM system where you would like to create the maintenance order and Step 3 – Once you have completed maintenance you may want to see last and next maintenance date also as an attribute in the usually company-wide used web client of the GIS for general information and as input for Step 1. This is only one way to design the maintenance process covering both SAP and GIS systems. Many of our clients have chosen different ways to design it based on their way of doing their work, their legal requirements and their IT technologies in place. At last year’s SAP for Utilities Conference in Den Haag, Netherlands, one of our clients gave a presentation on their integration between SAP and GIS, describing in detail e.g. their new, streamlined maintenance process and the resulting benefits. Many people from the audience came up to me after this talk and were beaming “now we finally understand the benefit of SAP – GIS integration”! Another of our customers wanted to display on the GIS map at a very early stage of the application process the position of a planned service point or of a planned positioning of a new solar panel. We integrated into their SAP frontend GUI a GIS map where the SAP users can automatically position the service point / solar panel using the address. Based on the application status, this planned new connection shows up in different colors / symbologies. This way, everybody within the company can view on the GIS map (which shows of course also the grid) now also the planned new connections. This was before not visible since this information was only available within the SAP ERP. As you see there are many quick and small ways to integrate SAP and GIS. But the benefit in terms of process efficiency is tremendous! If you want to learn more about this, then visit us at the International SAP Conference for Utilities in Lisbon (March 28-30, 2017). Our company AED-SICAD will have a booth there, and we are both platinum partner of the world wide leading GIS company (Esri Inc) and application development partner of SAP. Of course our EAI tool UT Integrator has been certified for integration with SAP® ERP. We have developed LatLonGO/HERE, a SAP Certified GIS agnostic ERP Mobility solution embedded as two-way interface inside SAP-PM, SAP-MRS and offline SAP-WorkManager. LatLonGO/HERE integration allows for offline address search and road network navigation. LatLonGO is embedded inside Innovapptive/mWorkOrder, SAP Pinnacle Awards Winner 2015 and 2016. I understand this is an older post, but only just today stumbled upon it. We are not a utility company but are currently working on an Arc <-> SAP ERP integration project. One of our current stumbling blocks is authentication and authorization for the SAP ERP data via BW. We are required to use SSO and the access to the BW data must be via a named user. My question is how do you handle this authentication in your application? Would be interested if you can lay down the sequence on how do we implement SAP-GIS integration? What are the FMs, BAPIs, RFCs, etc used to obtain this feature?